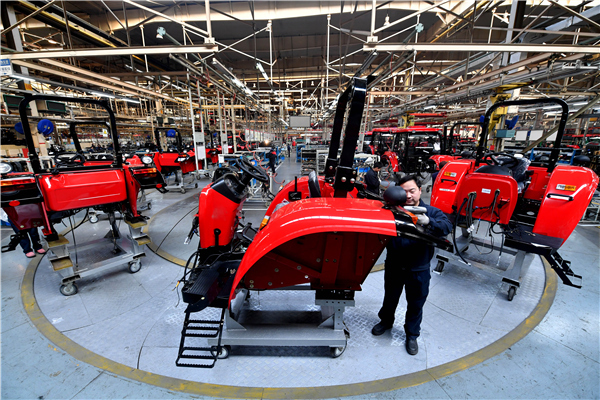 China will devote more resources to reforming its manufacturing sector with new, innovative technologies, while improving the higher education system’s ability to produce quality talent capable of original, groundbreaking work, officials said on May 26. China will invest around 110 billion yuan ($17.2 billion) by 2020 to help the country’s top 42 universities become first-class institutions, while creating 137 universities with first-class standing in specific fields, Yang Wei, former director of the National Natural Science Foundation of China, said during a panel discussion at the 20th annual meeting of the China Association of Science and Technology in Hangzhou, Zhejiang province, which opened on May 26. During the opening ceremony, Zhou Ji, president of the Chinese Academy of Engineering, said high-quality talent can promote greater use of new technologies in China’s manufacturing sector and help turn China into a world-class manufacturing powerhouse by 2035. Wan Gang, president of the association, said China needs to become self-sufficient in the core technologies of advanced scientific fields, including space, telecommunications, medical equipment and robotics. Minister of Science and Technology Wang Zhigang said China is blazing a new development path centered on creating high-quality talent and technologies to lead industrial and economic growth. Wang said the four main challenges for China’s scientific and technological innovation are the inability to solve key problems in core technologies; a lack of research direction in frontier sciences; a lack of mechanisms to organize innovation resources from companies and the public sector; and a lack of globally influential industrial standards set by China. Therefore, the government needs to provide consistent and lasting strategic planning, policy and legal services for science workers; help nurture influential scientists and world-class research institutions; and create a favorable institutional and social environment for scientific thought and innovation, Wang said. At the same time, more resources will be devoted to technologies that can help reform China’s manufacturing industries and improve people’s livelihoods, such as artificial intelligence, robotics, big data, cloud computing, clean energy, biology and medicine, he said. This year marks the 40th anniversary of China’s reform and opening-up, as well as the 60th anniversary of the China Association of Science and Technology. More than 2,500 participants from 26 countries and regions joined the association’s annual meeting this year. Stephen Welby, president of the Institute of Electrical and Electronics Engineering, an international science organization, said: “Chinese scientists have been essential in creating many technologies that we have taken for granted. Jack Ma, founder of e-commerce giant Alibaba, said it is crucial to pay attention and invest in fundamental science and its applications. He said artificial intelligence, the internet of things and blockchains are the three technologies that will change the world in the next two decades. “Profits for future companies will not come from their size and scale but their ability to innovate on fundamental levels,” he said.